Welcome to Found Off The Street, our look at cars found on the cape that rust liked so much it decided to summer there; Cape Cod, MA. Today we have a 1978 International Scout Terra. Even though Scouts are fairly rare on the cape rust remembered we've seen two Found Off The Street to this point. This has more to do with the fact I'm constantly on the look-out for old Scouts than some kind of bizarre Cape Cod Scout surplus. The very original Scout Terra seen here makes three and is another rare example of an original Scout in the Northeast that has somehow managed to stay rust free. 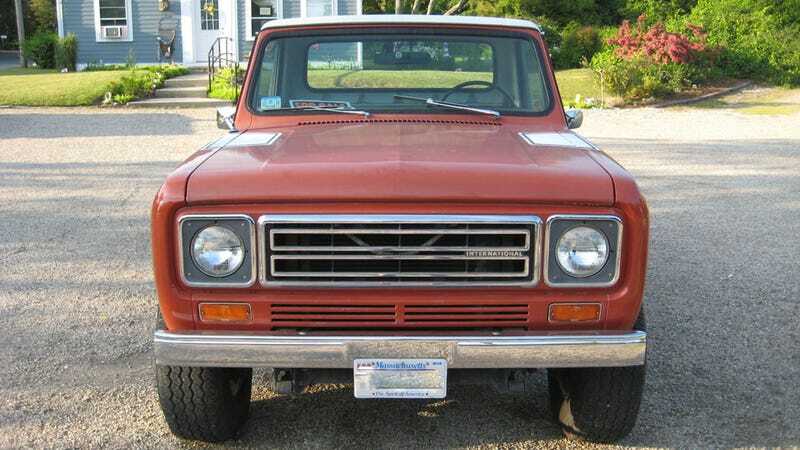 Scout Terras were first introduced in 1976 as a pickup truck variation of the Scout II. Terra's featured a short fiberglass top to cover the passenger compartment in front of a bed that was stretched 18 inches over the standard Scout. Although there had been an optional pickup truck configuration for the earlier Scout body styles, the beds were tiny at best. The Terra's stretched body style made a bigger bed possible. If you have ever wondered what a well preserved and original 1978 Terra is supposed to look like, you need only look to this week's FOTS Scout for an answer. The slightly aged Ralleye stripes on the side suggests this truck is still wearing the same coat of paint it left the factory with 33 years ago. Further inspection revealed an amazingly clean and rust free Scout with nothing to hide. What better excuse to go for a cruise in your old Scout than to look at another old Scout? That was my precise logic when I pulled my own old IH out of the garage last week on the first sunny day in what seemed like forever. What I found was an unbelievably nice and original Terra that in unbelievably nice condition. The relatively low miles on the odometer (60,000) aren't enough to explain the immaculate condition of this truck. You'll have a hard time finding a Scout with high miles considering the fact they are truly awful to drive on the highway for an extended period of time. It was clear from its original condition that this Scout has lived a pampered life free of the beaches and salty winter roads that led so many others to an early grave in the Northeast. Adding to the intrigue of finding such a nice Scout on the cape that rust remembered is the fact this Terra is For Sale. You read that right, the current owner is actually doing the unthinkable (at least to me)—trying to sell his Scout. According to the sign in the front window $10,000 is what it will take to make this Terra yours. Although I prefer my smaller and even more archaic '67 Scout 800, I'll certainly be a little jealous when someone eventually decides to purchase this rare old IH.